Note: Though many people still use the term “wolf hybrid,” this is not an accurate term. A ‘hybrid” is the offspring of two different species. Following reclassification of the dog by taxonomists in 1994, the domestic dog (canis lupus familiaris) is actually viewed as a domestic variant of the gray wolf (canis lupus). Yes, even your Chihuahua! How much wolf do they have in them? Most people, when they ask this question, want to know the percentage of wolf in the wolfdog – 90%? 50%? 25%? Unless you know the animal’s heritage for many generations back, there is no way to tell for sure. People who work with wolfdogs are more concerned with wolf content. This is usually determined by phenotyping, making an educated guess based on various physical and behavioral traits. Content can vary between animals from the same litter. What are they mixed with? Most of the wolfdogs we see are a mix of German Shepherd Dog, Alaskan Malamute and/or Siberian Husky. People want wolfdogs that look “wolfy,” and these breeds most resemble their wild cousins. Most wolfdogs today have all three breeds of dog in them. Where do they come from? Do people actually breed them? People actually breed them. There are some ethical, responsible breeders out there. They keep accurate and honest records, are particular about what they breed into their lines, evaluate and educate potential buyers carefully, and take back the animals they sell if they do not work out, for whatever reason. Unfortunately, such breeders are rare. Most of them do not care what type of temperament or health problems may be in their lines, often misrepresent the heritage of the animals, will sell to anyone who shows up with the purchase price and, once the sale is done, that’s that. If the buyer has a problem or can’t keep the animal, too bad. And that’s when the wolfdog ends up in rescue. Aren’t they really wild animals? Shouldn’t they be running free somewhere? Wolfdogs are NOT wild animals. They are NOT half wolf/half dog. They are domestic animals (see 9 C.F.R. 1.1), with special needs. They depend on humans for food and protection, and often for companionship. A person who dumps his wolfdog in the woods, believing it can take care of itself, is sentencing that animal to fear, confusion, loneliness, and a death by starvation, disease, attacks by other animals, or a bullet. Aren’t they mean and aggressive? Wolves are, by nature, timid around humans. Likewise, so are high content wolfdogs. Should you have an intruder, your wolfdog is much more likely to hide under the bed than to face him. So-called wolfdog “attacks” are either a misinterpretation of behavior or not perpetrated by wolfdogs at all. Up until 2010, there had never been a reported attack on a human by a healthy wolf in this country. Are they good with small animals? What about with children? I want a wolfdog! Now what? First of all, you need to make sure you are allowed to keep one where you live. Wolfdogs are illegal in some parts of the country. Even if it is legal to own one in your town, you may be required to have specific containment or a special permit. Be sure to check it out before you adopt. See library.municode.com for your city/county/state. Second, do your homework. Learn all you can about wolfdogs so that you are able to decide whether a wolfdog would be a good match for you. Volunteer at Full Moon Farm! Visit websites: www.fullmoonfarm.org , www.wolfpark.org, www.wolfdogproject.com, www.inetdesign.com/wolfdunn and www.world-of-lupines-foundation.com, are excellent places to begin. Read: We recommend Living with Wolfdogs by Nicole Wilde, and The Wolf: Ecology and Behavior of an Endangered Species by David Mech, for starters. Talk to wolfdog owners, either locally or on-line. Check out internet mailing lists, such as Wolfdogz on Facebook. Don’t be afraid to ask questions! Volunteer at a local wolfdog rescue (hint, hint). Then, when and if you’re ready for a wolfdog, contact a wolfdog rescue organization. 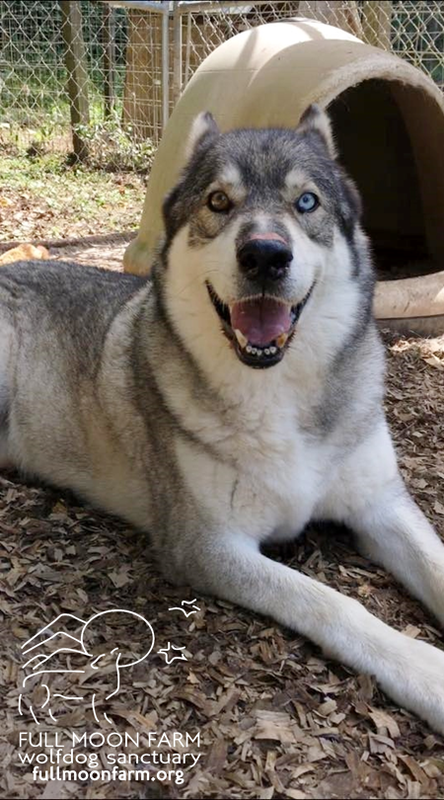 Whether you’re looking for a youngster or an adult, low content or high, couch potato or wild and wooly, they can put you in touch with someone who can help you find your lifetime wolfdog companion.